Website Testing means measurement of how well a website aligns with the behaviors of online users, enabling them to complete their tasks effectively, efficiently and satisfactorily. We offer website testing services to advocate your daily project demands for site selection, design, content and construction. Our approach is to study your pages to find error that cause common user frustrations. After service, our experts will ensure that your website has been thoroughly tested to iron out. 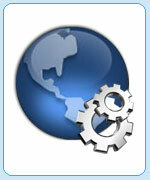 Our website testing team will rectify the error in CGIs, Java, .NET, etc.